The Polar vortex is a mix of large area of low pressure with cold air surrounding the Earth’s North and South poles. By the term, Vortex we understand that it’s an anti-clockwise circulation of air which keeps the cool air close to the poles. Generally, during winters in the Northern Hemisphere, the polar vortex becomes less stable and expands, thus sends cold Arctic air southward over the United States and South Canada with the jet stream. The past one week has seen some ferocious weather hitting the U.S. and Canada. 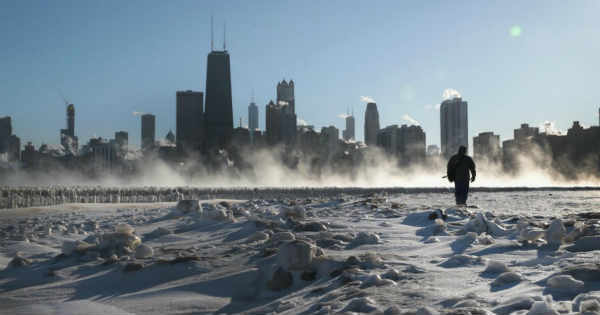 The cold snap of Arctic blast brought in record breaking cold, causing at least a dozen deaths, canceling and delaying thousands of flights in the Midwest U.S. This ferocious weather caused hundreds of traffic accidents as well. Such harsh and biting winds make the extreme cold much more life threatening. When the mercury plummets and sub-zero conditions stem up, frostbite then becomes a real serious threat. Frostbite is when a specific part of the body becomes frozen. After days of continuous bitter winter weather which set the temperature as low as -56°C in Cotton, Minnesota; the system brought all modes of travel to halt and can be tagged as 2019’s worst polar vortex. Now, it looks like that this powerful storm is all set to subside. Since, now this weather system is shifting eastward, this ferocious Arctic blast is all set to hit the Scandinavian countries like Sweden, Denmark and Norway. The local authorities have already issued warning over these regions.